The first section contains general information. It shows the Server name and its Operating System, the number of CPUs and Storage details, Public and Private IPs. By clicking on the Server name, you can expand or hide the sections. The second section contains the information about the Server's state. The statistics are updated every 24 hours. Provisioning: The virtual machine is being provisioned after the cloud server is created. Provisioning takes from 15 to 20 minutes. Migrating: Cloud server is under migration process. Running: The server is up and running. Stopped: The server was shut down or powered off. Note: If average CPU, memory, or storage usage is over 70%, the respective resource will be highlighted and a notification (yellow) will be displayed recommending an upgrade. If average CPU, memory, or storage usage is over 90%, the respective resource will be highlighted and a notification (red) will be displayed recommending an upgrade. Each server resource upgrade will require the server to be powered off. Upgrade Server action will initiate an ungraceful Power off which may result in loss of unsaved data. In order to avoid this, each server should be manually Shut Down before initiating the Server Upgrade. You can perform upgrade or downgrade of your CPU and Reserved Memory. The Storage downgrade is not available. Use Modify Server button to change server configuration. Note: Server Console does not work over Proxy Servers. Please disable them. When it is downloaded, run it and click Next. Reset Admin Password: Use this option to reset your password. Important Note: To reset the password, you need to shut down the Cloud Server. If the server is running, Reset Admin Password option is grayed out. 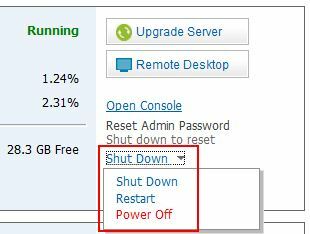 Shut Down: Use it to shut the server down or power it off. Shut Down sends a shutdown signal to the guest operating system causing it to shut down gracefully. Power Off is the power switch for the server. It forcefully powers off the server. Power On: Use to power on the server after shutting it down or powering off. Delete Server: Permanently delete the server.